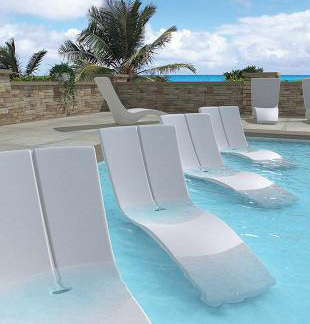 As resorts and hotels strive to create a more modern and inviting stay for their guests, pool ledge furniture has grown in popularity and can be found at numerous luxury locations across the USA. This uptick in popularity has resulted in us receiving an increasing number of questions from customers concerning commercial pool furniture that are safe to leave in the water and use for pool ledge relaxation. In this article, we have collected data that we hope our customers will find helpful in answering any questions that they may have on the subject. Please find our “Pool Ledge Furniture Guide” below with options that we both recommend and do not recommend for pool ledge use so you can upgrade your pool area confidently and safely. What is a Pool Ledge? A Pool ledge, also known as tanning ledge, Baja shelf, or a sun shelf, have become increasingly popular over the last few years for both commercial and residential swimming pools for its soothing atmosphere. A pool ledge is a raised platform in the pool, creating a shallow area of water that is usually no more than a foot deep and at least wide enough to set a couple of chairs or chaise lounges on. This concept is appealing for those looking to relax, tan, or maybe read a book on a hot summer day, all while having their body partially submerged in the refreshingly cool water. By adding pool ledge furniture to your hotel or resort you are sure to find that your customers will stay longer and want to come back. After years of working with our customers in the field and consulting several manufacturers, we have compiled a list of recommended options for those looking to purchase pool furniture for in water use. These materials won’t harm your pool ledge or throw off the balance of the water, making them a safe, wise investment for your commercial property. The best pool furniture frame material designed to stay in the water on the pool ledge is 100% plastic resin, without a sling fabric seat. A few great examples of this are the Signature Ledge Lounger chaise lounge, Grosfillex Bahia chaise lounge, and Nardi Eden chaise lounge. Both feature a 100% plastic resin mold that is crafted together with the frame eliminating the need for any metals whatsoever. Made of high-density polyethylene (HDPE), plastic resin furniture is extremely strong despite its lightweight build. Plastic resin furniture will resist fading from long exposure to the sun as the colors are blended through the material and won’t rot, corrode, or breakdown from chemicals associated with pool maintenance. Additionally, the non-porous, smooth surface doesn’t leave any weaknesses in the frame for water to infiltrate and damage. A plastic resin chaise lounge can be set on the pool ledge for days without harming the water or the water harming it. Because of this, we recommend the plastic resin options over all others. With its water resistance build, cost efficiency, and easy maintenance, plastic resin furniture is a perfect choice for pool ledges everywhere. Another great option for pool ledge furniture is marine grade polymer (MGP). Like plastic resin, MPG is also a high-density polyurethane and contains all the water-resistant advantages fit for a pool ledge. MPG is the heavyweight among plastics, nearly doubling the weight of its plastic resin equivalent. This makes it much more resistant to strong winds and choppy water currents. Specifically designed for harsh saltwater treatment, MGP will easily last many years on your pool ledge without any hassle, as long as it doesn’t contain any metal hardware or sling fabric seating. The Curved Rotoform polymer chaise lounge is an ideal choice for the pool ledge, meeting all the requirement for safe in pool use. It is also manufactured by one of the leaders in the commercial furniture industry, Tropitone. Marine Grade Polymer is the most durable pool ledge furniture you can buy today, but it also is the most expensive. It’s not uncommon for this heavy-duty material to triple the price of other plastic pool furniture. That said, those who invest in MGP will have the peace of mind knowing they have a product that will never need to be replaced. Though many clients have used some of the following on their pool ledge without incident, the below materials are not designed or recommended to be kept in the water. If left in the water for prolonged periods, the integrity of the pool furniture will start to decline, giving you less life out of the product. Certain materials may even cause damage to the water or the ledge itself so please be aware of this before purchasing your pool ledge furniture. Due to its corrosive properties under ideal conditions, aluminum is not recommended for in water use. Aluminum patio furniture comes with a powder-coated or galvanized protective finish that will be worn thin with overexposure to acids. Aluminum, fortunately, will not rust like other metals. The difference is rusting will destroy the frame by expanding and detaching the damaged metal into red flaky pieces eventually shredding it apart completely, while corroding creates pits and blisters that reveal more of the healthy metal. Though aluminum corrosion is a slower process, eventually your furniture will need to be replaced, due to the weakens the density of the frame. 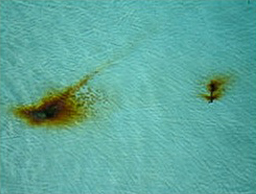 Corrosion will not cause red stain as rust does, however, it could be harmful to the pool water with enough contaminates. 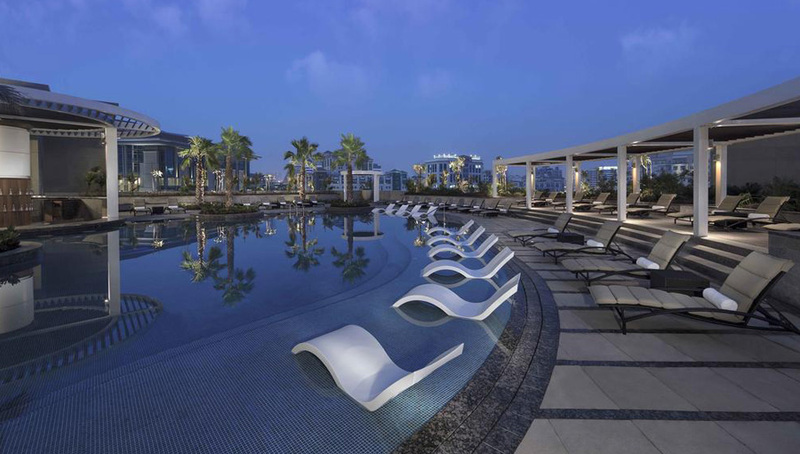 Although recycled plastic is a safe hardy material that can be kept in the water, pool furniture made from it is often structured together with metal hardware, which is not recommended. Recycled plastic is one of the longest lasting high-density polyethylene (HDPE) products and is compressed and melted together to form strong plastic lumber. The lumber can be cut and styled into desired shapes, but often is not structured as one solid piece to ensure complete water resistance. Vinyl straps will not be damaged by pool water quickly, but if left inside chlorine water for extended periods of time they will eventually begin to fade and crack. The constant contact with the chemicals used in a pool will wear down the UV color protectant in the material, leaving the straps at the mercy of the bleaching effects of the sun’s rays. Most often vinyl straps are coupled with metal frames, which once again are not suitable for in water use. 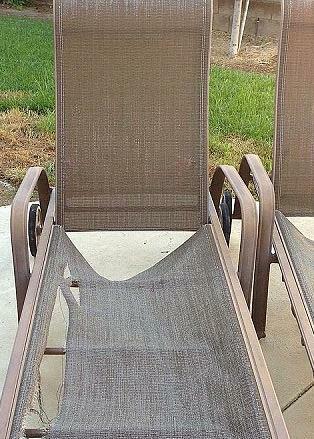 Please stay away from using any aluminum framed vinyl strap furniture for in-pool use. It isn’t the worst thing to place on the pool ledge and vinyl straps are relatively inexpensive to replace. Keep in mind that the straps will need to change twice as fast than normal, so it’s better to leave all the strap furniture on the poolside to keep them more vibrant longer. Comfortable sling and cushion fabrics are considered water-resistant for regular poolside use, but they will not last long soaking in the pool water all day. The strong fabric is often made from well-woven acrylic, that’s double stitched for extra durability. Pool water typically doesn’t distress the fabric when it can dry off in the air, however, if used in a pool the combination of water and weight will cause the sling fabric to weaken quicker. 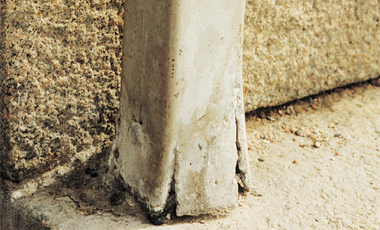 The constant motion of the water along with the maintenance chemicals will loosen the ends causing them to fray. In addition, just like vinyl strap, the pool chemicals will attack the UV protectant coating resulting in premature fading. Together these issues will result in premature tearing and unsightly pool furniture that will need sooner replacements. Altogether sling and cushion fabrics will not harm the condition of the pool, it was never made to be used as pool ledge furniture.The water will ruin the sling fabric and at the rate of replacements are needed can become very costly. A commercial grade sling will last years at a well turnover business if it stays out of the water. Pool furniture made from steel is not fit to be set on a pool ledge due to its ability to rust. Steel is often protected with a powder-coated or galvanized layer to shield the raw material from the mixture of water and air that ultimately causes the metal to rust. Placing the steel furniture into the pool on a sun ledge allows water to be trapped in the frame’s tube by seeping through the rubber or vinyl foot protectors on the bottom. Even when removing the furniture, the water will remain for a while on the inside without proper ventilation to dry out. Over time the acidic nature of chlorine, acid rain, or salt water residue will dissolve and weaken the protectant barrier, thus exposing the bare metal. 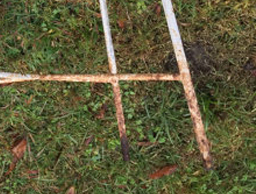 This will cause the steel to rust, which can containment the pool water, create hard to remove reddish stains on your pool ledge, and destroy the stability of the pool furniture frame itself by damaged metal flaking off little by little. Though steel patio furniture is cost efficient, the price for cleanup, replacements, and overall aggravation will eventually create a much greater expense. It’s best to keep steel on the poolside where most of the water contact can be dried up quickly with a little wind and sunshine. It doesn’t matter what the frame is made of, if the pool furniture is fastened with metal hardware it is advised not to be set in the water. As addressed earlier in the article with aluminum and steel, the combination of water, oxygen, and chemicals will break down any protective layers and eventually start corroding the bare metal. Commercial manufacturers use the best heavy-duty, water resisting hardware available, such as stainless steel and allochrome, to prolong the life of their products against typical water contact. Unfortunately, even stainless will slowly corrode over time if left in water so it is best to steer clear of using any metal hardware for in-pool use. Over the course of this article Pool Furniture Supply has provided pool ledge furniture options and tips that will help you make the right choice for your business. We also covered several universally used materials that are not recommended for in water use as it will dramatically reduce the life of the furniture or may become harmful to you pool ledge or water. Below is an organized summary of the key points for each material. 100% Plastic Resin - No metal hardware or vinyl or sling fabric. 100% Marine Grade Polymer- No metal hardware or vinyl or sling fabric. 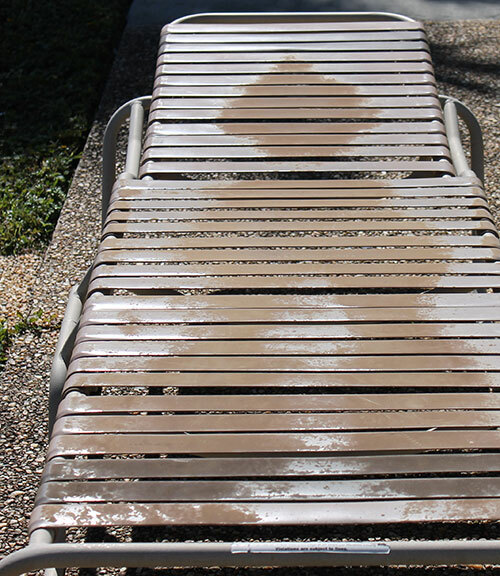 Will stain the pool ledge. May affect overall pool water condition. Pool chemical will dissolve UV protectant causing premature fade. Weakens the fabric resulting in needed replacements. Prone to rust or corrosion. May stain the pool ledge. We hope this information will allow you to make a safe, confident decision when choosing the appropriate pool ledge furniture for your business. By following this guide, you can put all your worries aside as your patron relax on your Baja shelf. After reading this article, did you find the content helpful? Was there enough information to assist you in making your decisions? Do you still have any unanswered questions about pool ledge furniture? Let us know what you think by clicking on comments below. Thank you for excellent advice and clarifying essential info I've been searching for awhile! How do I clean the furniture? What about the water used to fill the furniture how can I clean the inside? Which option do you recommend for vinyl liner pools?